This butter pie crust is fantastic! 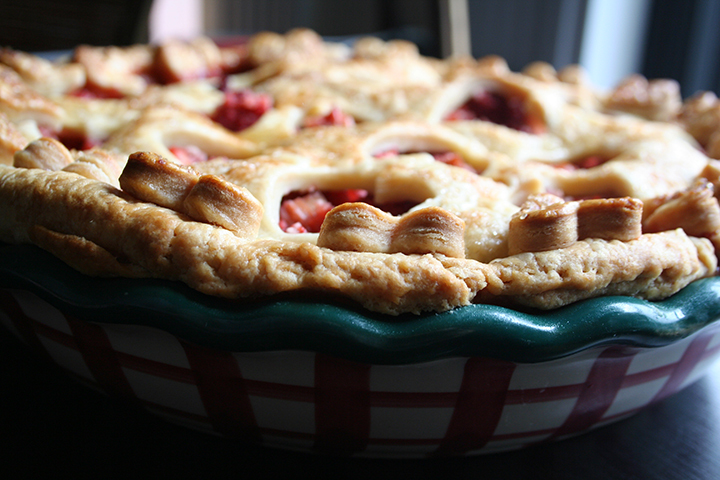 Try it at least once… perhaps with our Strawberry Rhubarb Pie!! If you wrap the dough tightly it can be refrigerated for 3 days or frozen for 1 month. For freezing we suggest that you roll out the dough into a flat disc, place it on a sheet of parchment paper that is larger than the disc, and then gently roll it up. Freeze the dough solid, then wrap it tightly in plastic wrap, and put it back in the freezer until you need it. Allow to thaw for about 15 minutes at room temperature before using. This recipe is for a double-crust pie. Stir the flour, salt and sugar in a large bowl. Add the butter pieces and with a pastry blender (or fork) cut the butter into the flour mixture until the butter is in pea-size pieces. A few large pieces are okay; try not to over blend. Combine the water, cider vinegar and ice in a large measuring cup. Sprinkle 2 tablespoons of the ice water mixture over the flour/butter mixture and cut in with the pastry blender until it is fully incorporated. Add more of the ice water mixture, 1 to 2 tablespoons at a time until the dough starts to come together in a ball. Squeeze and pinch with your fingers to bring the dough together, being careful not to over-handle the pastry. Divide the dough in half and shape into two flat discs, wrap in plastic and refrigerate for at least 1 hour, preferably overnight. When ready to bake, remove the dough from the refrigerator 5 to 10 minutes before you begin rolling. Dough that is too cold will develop cracks when it is rolled. Lightly flour your work surface and roll the dough until it is 2 to 3 inches larger than the pan you are using and about ⅛ inch in thickness.